WEST HARTFORD, CT and NEW YORK, NY--(Marketwire - August 1, 2008) - OR-Live, Inc. and Advanstar Communications (parent company of Modern Medicine) announced today a collaboration to provide the physician community with a destination portal for educational videos. OR-Live has established a new paradigm in medical education with the use of streaming video, while ModernMedicine.com is a leading, targeted destination site for these professionals offering a wealth of on-line educational opportunities. A new OR-Live surgical video center within Modern Medicine will enhance existing professional development. The collaboration with OR-Live will provide Modern Medicine users with direct access to over 115 full length surgeries from within multiple specialties including Breast Cancer, Cardiovascular Disease, Cosmetic Surgery, Gastroenterology, Neurology, OBGYN, Oncology, Ophthalmology, Orthopaedics, Pediatrics, Primary Care Medicine and Urology. New surgical programs will be added weekly. Daniel Timoney, Marketing Director of Advanstar's Electronic Media group, said, "Our collaboration with OR-Live will provide our subscribers with a new and exciting educational avenue, complementing Modern Medicine's comprehensive resource for doctors clinical and practice management needs." Ross Joel, CEO of OR-Live, commented, "We are excited about our affiliation with Modern Medicine, which is clearly one of the most comprehensive aggregators of trusted, quality content." ModernMedicine.com (www.modernmedicine.com) is a new online healthcare portal that was launched nationally in January 2008 by Advanstar Communications Inc. after being in beta since April 2007. Modern Medicine provides extensive clinical and practice management resources for physicians and other healthcare professionals, including innovative interactive tools for clinical information, CME, reimbursement coding, customizable patient education materials and health plan formulary status. With promotion to healthcare professionals staring last January, total registered users have grown rapidly from 20,811 to over 100,000 as of June 2. Importantly, all physicians practicing in the U.S. who register on Modern Medicine are authenticated against the AMA database. Advanstar Communications Inc. (www.advanstar.com) is a leading worldwide media company providing integrated marketing solutions for the Fashion, Life Sciences and Powersports industries. Advanstar serves business professionals and consumers in these industries with its portfolio of 47 events, 60 publications and directories, 95 electronic publications and Web sites, as well as educational and direct marketing products and services. Market leading brands and a commitment to delivering innovative, quality products and services enables Advanstar to "Connect Our Customers With Theirs." Advanstar has approximately 1,000 employees and currently operates from multiple offices in North America and Europe. OR-Live (www.or-live.com) is an innovator in digital online healthcare communications, serving the needs of the healthcare industry, academia, hospitals and clinical practices in a global environment. OR-Live features a comprehensive, medically substantive, approach to online communications with expertise in delivering interactive and live digital content. 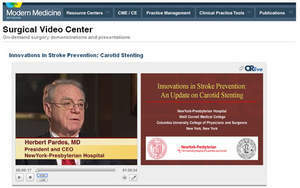 OR-Live maintains a clinical video library that features over 600 on-demand surgeries for immediate viewing worldwide using streaming video technology. With over 200 live events expected to be added during 2008, OR-Live offers the ability to continuously create and update innovative online content. A trusted source, OR-Live is a charter member of the Health-On-The-Net foundation, as well as a provider of surgical video to the US National Library of Medicine's MedlinePlus.gov.